The ATP site has been described as one of the most important industrial archeology sites in New Jersey. It contains the remains of a complex collection of 30 mill buildings, the third tier of the raceway and now-covered wasteways to the river. The historic structures and raceways are extremely complex, covering a time span of over 200 years. Unidentified historic properties are two underground culverts and their connecting wheel pits that are part of the Todd Mill. These two 150-foot stone arch culverts, wheel pits, and stone arch openings at the river are not described in the Maxman Report, which was the initial architectural assessment of the ATP site. Also, it is quite possible that an 18th century sawmill may have been located on the ATP Site. While probably not as large as the later mills, discovery of any remnant of this sawmill would help answer many questions about the early development of the waterpower system. There is an overwhelming request by the public to preserve and interpret the historic waterpower remains on the ATP site as much as possible and to focus interpretation on the 18th and 19th century period. The early waterpower era was extremely important to our nation. Concerned citizens and Paterson authorities believe that a genuine and thorough conservation of the mills and raceways is merited, especially in light of a national park option. The city must be strictly prohibited from demolishing any of these historic resources so that an appropriate plan can be made for their interpretation. 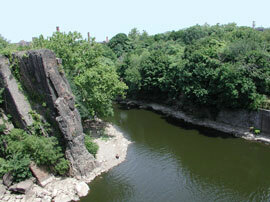 Preservation of the "Cultural Landscape"
The drop in elevation of the Passaic River at the Great Falls enabled the use of waterpower. The raceway system diverted water from above the falls into three successive levels. Waterwheels were situated along these raceways to convert the force of the falling water into moving belts and pulleys to drive the machinery. Mills on the ATP Site were set into the side of embankments and large excavated depressions to maximize this power. 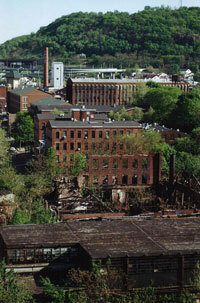 The Waverly and Passaic Mill complex was completely excavated on a massive scale. The terrain around the Todd Mill drops 14 feet from the front to the back of the building for the use of two overshot water wheels that were inside the mill. One of these wheels was still in operation in the 1930's. The understanding of the terrain and its preservation is as much a part of the district as the preservation of the mills. We must avoid an adverse effect and preserve this site's National Landmark status by not altering the terrain. The Secretary of the Interior's Standards of Preservation, Rehabilitation, Restoration and Reconstruction must be applied to the Cultural Landscape on the ATP site. 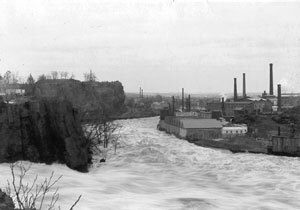 There is a dramatic increase of people's interest in the use of waterpower in the early industrial age, yet there are few examples that match the Great Falls / S.U.M. National Historic Landmark District in scale or importance. The ATP site is a key element because it contains the third tier of the raceway system. The full cycle of the waterpower usage starts out at the falls, continues along the upper, middle and lower raceways, then returns to the river through the ATP site, creating an astonishing pathway of early American engineering. This complete cycle must be preserved. Creating continuous and uniform walkways and bike paths for the public at the Great Falls, through the mill district, along the raceways, and along the river is a very important aspect of heritage tourism. These paths will unify the historic district and improve the quality of life for the residents of the area. Nationwide, easy access to parks, playgrounds and open space has become a new measure of community wealth - an important way to attract businesses and residents by guaranteeing both quality of life and economic health. The pathways could continue further up and down the Passaic River, connecting the historic district to Westside Park and Pennington Park. A "Riverfront Study", being implemented through an EDA grant, will make recommendations for increasing public access along the Passaic River from Pennington Park to Market Street. The State of New Jersey's commitment to limit suburban sprawl will redirect growth into urban centers. Paterson must improve what green space it has to make high-density living more attractive. Plans can be made to conserve the land along the Passaic River and provide riverfront access and a social gathering place for the multitudes of people in this densely populated area. The western half of the ATP site contains a very large depression that was a result of brownstone quarrying. It has been suggested again and again by interested members of the public that this natural amphitheatre be used for outdoor cultural, religious, and entertainment events. This would also accommodate the thousands of people who attend the popular celebrations and carnivals held at the Great Falls Park and McBride Avenue Extension. 1. Preserve open space to protect critical environmental resources, such as wetlands, floodplains, steep slopes, and stream and river corridors. In the more developed areas of the Passaic County, both urban and suburban, there remain areas with streams, wetlands and woodlands that provide habitat and water quality functions. 2. Assist in the preservation of cultural, historical, and archaeological lands. 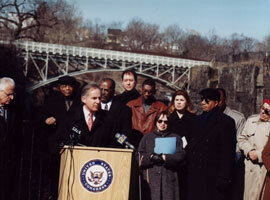 The Great Falls Park can become the focal point around which many other economic benefits can be built. Since the 1700's, these falls have been recognized for their beauty. The park around them should be redesigned to complement the natural environment of the Passaic River. This design should be developed to meet the standards of the National Park Service so that eventually the park can be managed by this agency. The historic district around the Great Falls should continue with its redevelopment plans to complement the redesign of the Great Falls Park. The long-term economic benefits to the county of this park's redesign and redevelopment could establish a tourism program of international dimensions. 3. Promote and increase greenways and pathways for pedestrian and bike recreation. As redevelopment occurs in the cities and towns along the Passaic, a greenway should be created with a diversity of activities, such as walking paths, bikeways, picnic areas, etc. 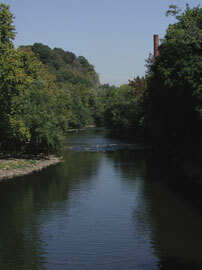 During the nineteenth and early twentieth centuries, the Passaic River from the foot of the Great Falls to Dundee Dam was a significant part of the recreational base of the county. With the improvement of water quality, which has occurred during the past twenty years, a plan should be developed to utilize this stretch of the Passaic River for water based recreation. Access points should be identified, boating facilities established, and a program created to encourage citizens to take advantage of this resource. 4. Protect and preserve drinking water source supply lands. With improved water quality and watershed management programs being initiated by the State of New Jersey, the county should be an active participant and advocate for projects to benefit the urban region and the Passaic River. Every opportunity should be taken to pursue the enhancement of this region of the county. Any introduction of a visual element must be in character with the historic district and sensitive to the site's landmark (and possible national park) status. 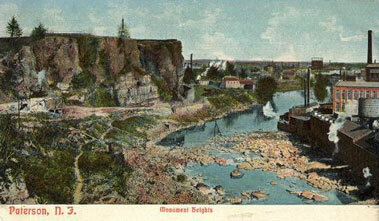 The incredible viewshed from the Great Falls and the cliff top across the river must not be detrimentally impacted. An endeavor of this magnitude will require sustained attention and constant vigilance. In cities where a consortium of individuals, organizations and governmental agencies regularly meet to plan and direct the development of their city, the outcome is much superior to those where there is no consortium. Close working relationships must work interactively toward the best possible preservation and interpretation of this site. With critical public involvement, there will be checks and balances on our political leaders and our governmental agencies. Problems will be debated justly, resulting in detailed and qualified decisions.